All three people detained on suspicion of arranging an acid attack on Bolshoi Theater Ballet Director Sergei Filin have confessed to their wrongdoings, a Moscow city police spokesperson told Interfax. A Moscow city police spokesperson told Interfax thatl three people detained on suspicion of arranging an acid attack on Bolshoi Theater Ballet Director Sergei Filin have confessed to their wrongdoings. "Pavel Dmitrichenko, who is suspected of ordering the crime, and Yury Zarutsky suspected of committing it, as well as driver Andrei Lipatov, have signed confessions and have been detained under Criminal Procedure Code Article 91," he said. 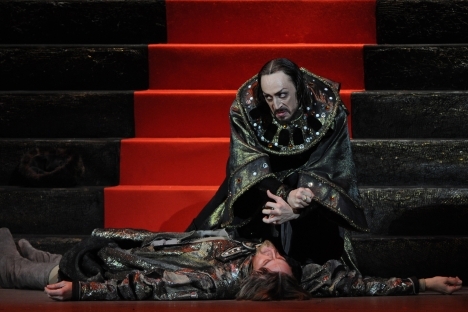 "I organized this attack, but not in the measure in which it occurred,"Pavel Dmitrichenko, Bolshoi Theater actor who played Ivan the Terrible in the eponymous ballet for the same name, said in a video statement aired on Rossiya 24 television channel on Wednesday. The Interior Ministry press center had previously told Interfax that one of the three people detained had confessed to the crime. "Hence, it would be safe to say that the crime has been solved," the press center said. Filin suffered burns to his face and eyes in an acid attack on Jan. 17. The preliminary investigation showed that Filin was attacked with sulphuric acid. Filin was hospitalized with burns to the face and eye cornea at the 36th hospital, where he had a series of eye operations. Filin was released a couple weeks later, after which he travelled to Germany for rehabilitation and additional surgeries. The attack is being investigated on counts of inflicting bodily harm, Russian Criminal Code Article 111, Part 1. Police link the attack to Filin's professional work. Employees of the Bolshoi Theater have been questioned as part of the investigation. According to the olice, Dmitrichenko's attack on Filin is based on personal animosity. "The attack was motivated by Bolshoi Theater soloist Pavel Dmitrichenko's job-related personal aversion to Filin," the Moscow city police department told Interfax. The Interior Ministry will ask a court to sanction the arrest of all three men believed to have played a role in the attack on Filin. The police is currently proceeding with the investigation to correctly qualify the actions of the people suspected of involvement in the attack. According to a source familiar with the investigation details, if found guilty the three may be imprisoned up to 12 years. "Preliminary inquiry bodies are deciding on qualifying the detainees' actions so as to charge them under certain provisions of [Criminal Code] Article 111 dealing with the infliction of serious bodily injuries," the source said. "Since the attack on Filin was committed by previous concert, the people involved in the crime are likely to be charged under the article dealing with 'deliberate infliction of serious bodily injuries', which carries up to 12 years of imprisonment." Filin is going to insist that the suspected attackers compensate him for the damage done to his health. "A claim for compensation of bodily harm will undoubtedly be filed," Filin's lawyer Tatyana Stukalova told Interfax. "My client thanked all law enforcement officers who took part in solving the crime. He learned about the detention of the suspects from the media. I cannot say that he was greatly surprised when he learned who was suspected of committing the crime." Stukalova said that they had not discussed the punishment they would insist on in court but noted that the tentative qualification of the offenses should be stringent to the utmost. "The range of Article 111 of the Criminal Code (causing severe bodily injuries). Considering that a group of people was involved we will count on the toughest qualification," she said.